ADL’s twice annual press briefing moved to their Scarborough plant for Summer 2017 in recognition of two significant anniversaries there – 110 years of Plaxton coachbuilding and ten years of the Plaxton business joining with ADL. 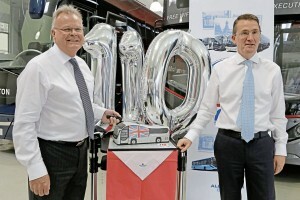 The event also marked ten years at the helm for CEO, Colin Robertson. 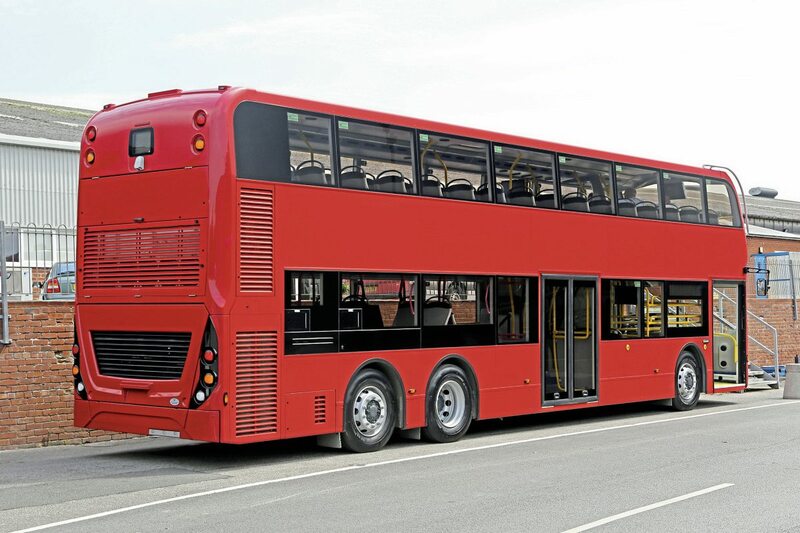 The exchange rate uncertainty generated by Brexit has impacted on the costs of raw materials and on componentry sourced in Europe, the latter accounting for up to 22% of a single-decker and 37% of a double-decker, however it was likely that competitors were similarly challenged. There was some positive currency impact in overseas markets but many deals were in sterling. reduction and build hours optimisation. The competitive market was tough for all players and Colin foresaw that the market would drive a price increase of at least 4%. The business landscape would get tougher from 2017 into 2018, something ADL was facing up to by looking after customers and promoting new models and new markets. 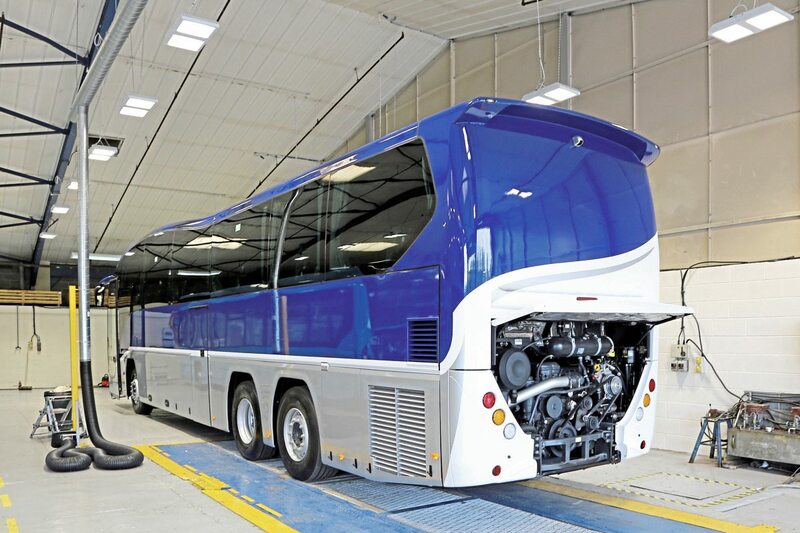 Success was also driven by close collaboration with partners such as BYD, Scania, BAE, Cummins and Volvo plus Mercedes-Benz for the Cheetah XL. 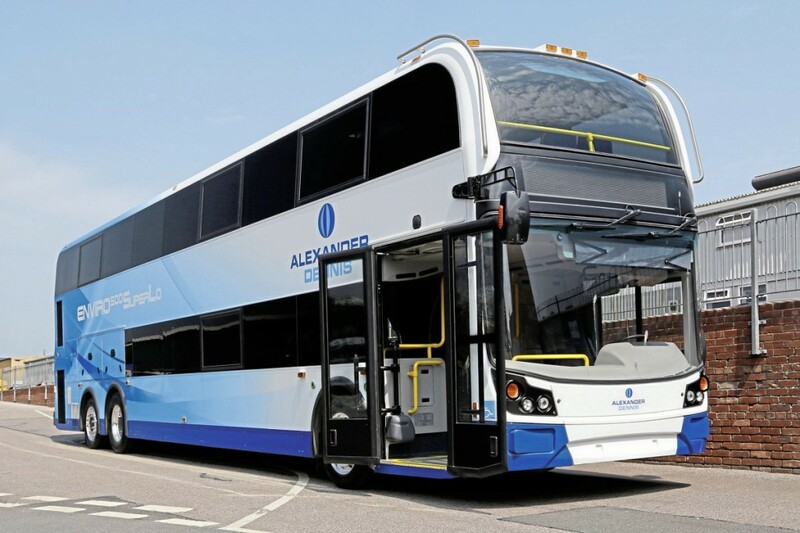 In 2016, ADL’s sales topped £600m, finishing marginally below 2015’s figure but boosted by record sales of £360m in the UK as companies strove to meet the double-decker compliance deadline. At £26m, operating profit remained at 4.4%. £20m was spent on new product development and engineering, equivalent to 75% of the profit generated, a figure which is expected to increase to £22m and 91% respectively in 2017. 2440 buses were built in 2016 including 183 coaches, 170 hybrids, 6 Biogas and 51 electric. The forecast figures for 2017 are 2243, 223, 219, 31 and 26 respectively, highlighting the continued importance of diesel models in baseload production. ADL had 2490 team members worldwide, 2175 of them in Europe, 220 in North America and 95 in Asia Pacific. 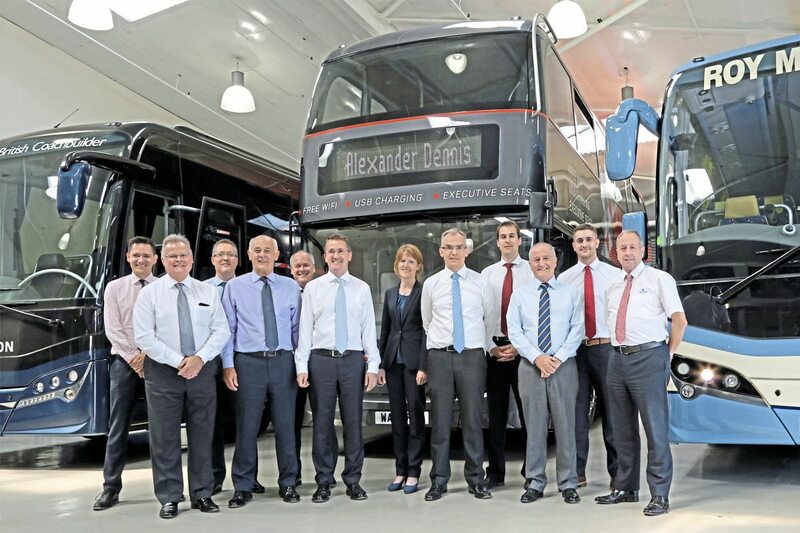 Commercial Manager – Coach, Mark Ballam, provided a brief overview of the significant growth in the Plaxton coach range since partnering with ADL in 2007. At that time, Plaxton had four basic model options, there were now eight with a wide variety of options. Investment had seen the development and production of new models, all stainless steel framed including the Elite, Elitei, Leopard, Cheetah XL and revised versions of the Panther. The Leopard has been particularly well received with 60 sold in its first year and over 170 sold to date. 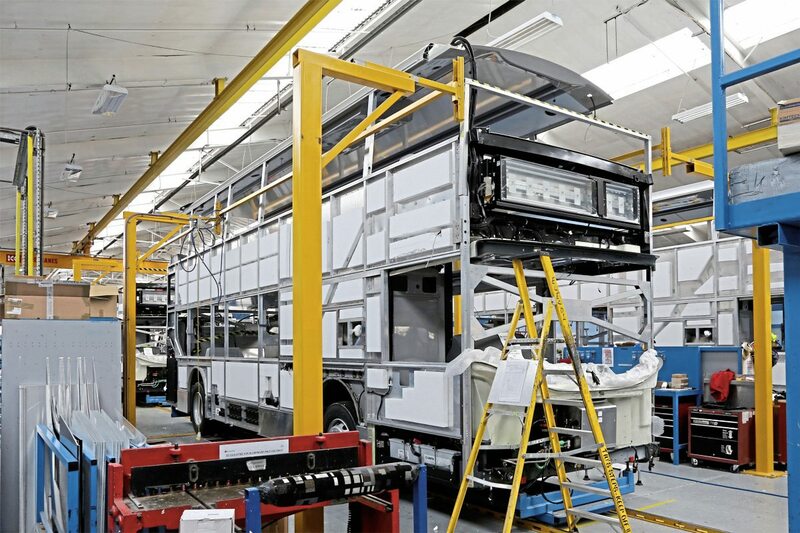 Looking at the challenges in coach, the investment to volume ratio is significant, there is limited skilled development resource available in the industry and little aftermarket benefit to ADL, the majority going to chassis partner Volvo Bus. Nontheless, there would continue to be an unwavering focus on customer requirements, quality, competitivity, weight reduction to maximise the benefits of two axles, and positive aftermarket support. The 2017 model range incorporates a number of developments following feedback from operators or focusing on potential whole life opportunities. These include revised steps on the Cheetah XL, dual seat tracking on stock Leopards to support 70 seat conversions and a second emergency exit at the rear of 12.2m Panther Execs to enable the centre step and toilet to be panelled over in future, giving six extra seats. Two new coach models were advised as under development for 2018 and Mark was able to give details of the first of these, a 14.5m low-entry version of the Leopard based on a Volvo B8RLE tri-axle chassis. 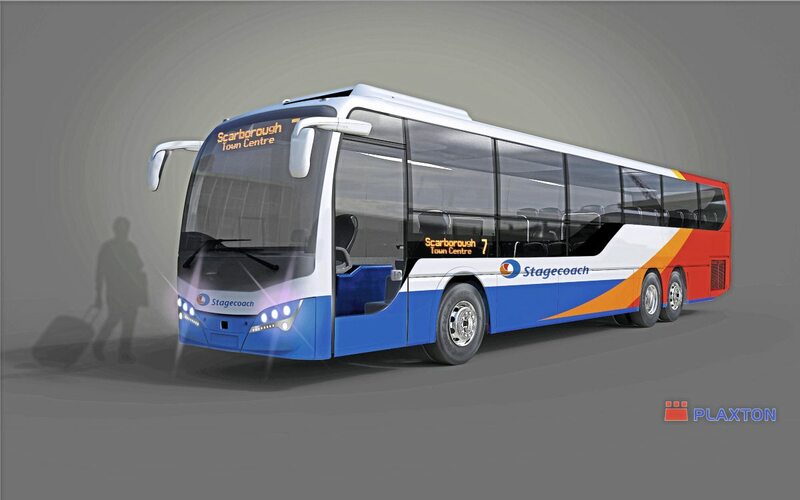 This has been developed: “working with an operator who is listening to the needs of its passengers.” The graphics showed an example in Stagecoach colours, an operator that has significant numbers of wheelchair lift equipped Plaxton Profiles due for replacement on longer interurban routes. The first example is due to be delivered in April 2018 with 53 seats, 17 of them in the low-floor area. Looking at the retail coach market, Head of Coach Sales, Mick McElhone, reported on the benefit of new models available as a result of listening to customers’ requirements including the 12.2m Panther, 14m Panther Exec and 61-seat Panther on two axles. Measures to ensure greater retail stock availability at the right time meant 2017 sales were running 100% ahead of 2016 with an expectation of around 120 units by year end. Mick was pleased to announce significant numbers of ‘conquest’ orders from previous Plaxton customers returning to the fold after purchasing other makes. He also presented feedback from customers on the question, why buy Plaxton? 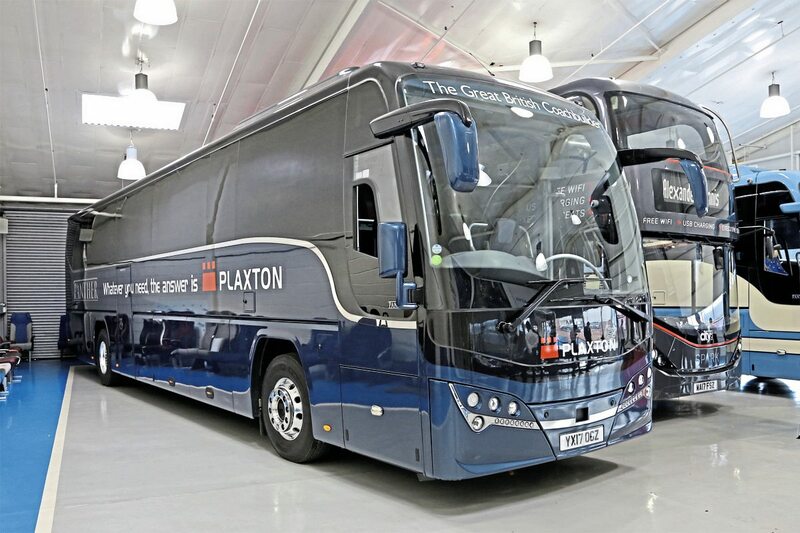 These included: high residual value: “I can always sell a Plaxton;” longevity and versatility; the ability to cascade and the quality of product and aftermarket support. Head of Advanced Engineering, Stuart Cottrell, presented ADL’s ‘Technology Roadmap’ focussing on three overlapping areas: the passenger experience; energy efficiency/zero emissions and autonomy/connectivity. He clarified how fuel burn efficiency impacted on climate change but had less impact on air quality locally, before looking at the factors that impacted driveline choice whether operational, policy or driven by available incentives. accessories and stop/start to deliver fuel savings of up to 17% compared with a conventional Euro 6 vehicle. It is quickly becoming the standard choice, even for applications where BSOG does not apply. With BSOG, the payback period is normally under one year. For 2018, ADL is developing a 48V Hybrid system using a motor generator connected to the propshaft via a drive belt and storing energy in supercapacitors. The system is independent on the vehicle’s 24V electric system and contains no high voltages. 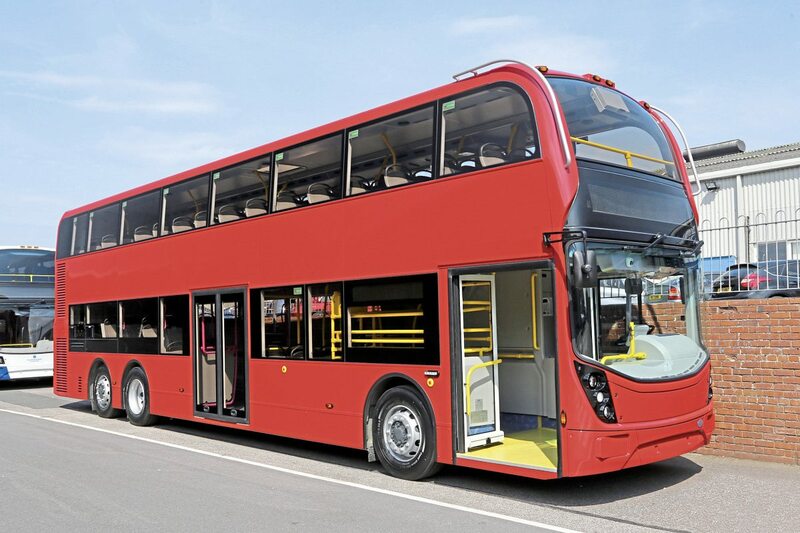 By recovering up to 12kW during braking, it can deliver an additional 180Nm torque on starting, reducing fuel consumption by 4-8% on an Enviro400. Stuart’s presentation also covered the successful introduction of bio-gas and electric products together with developments involving BAE to the full hybrid model, moving to ultracaps instead of batteries to give lower TCO or alternatively, the use of a larger energy store to deliver extended zero tailpipe emission capability. With the latter, it was anticipated that 80% of London bus routes that penetrated the ULEZ could be operated consistently in zero emission mode whilst in the ULEZ. 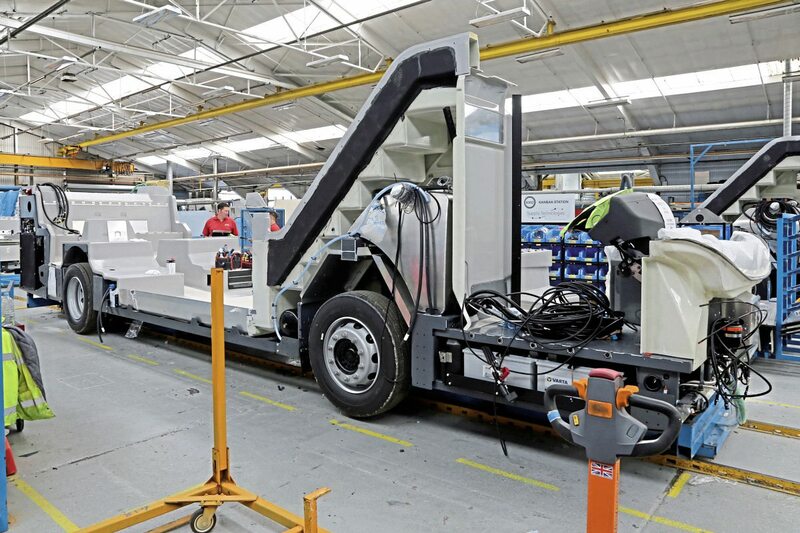 Turning to safety developments, ADL had looked at the personal injury statistics related to buses and identified front surface contact as the crucial area for development. Autonomous Emergency Braking (AEB) will use robust detection technologies to apply the brakes quicker than a driver can react and is currently being track tested on Enviro200 and 400 models. ADL is also working with TfL to define a Bus Safety Standard with AEB at the top of the priority list. Stuart made it clear that ADL were not currently looking at fully autonomous driverless buses. 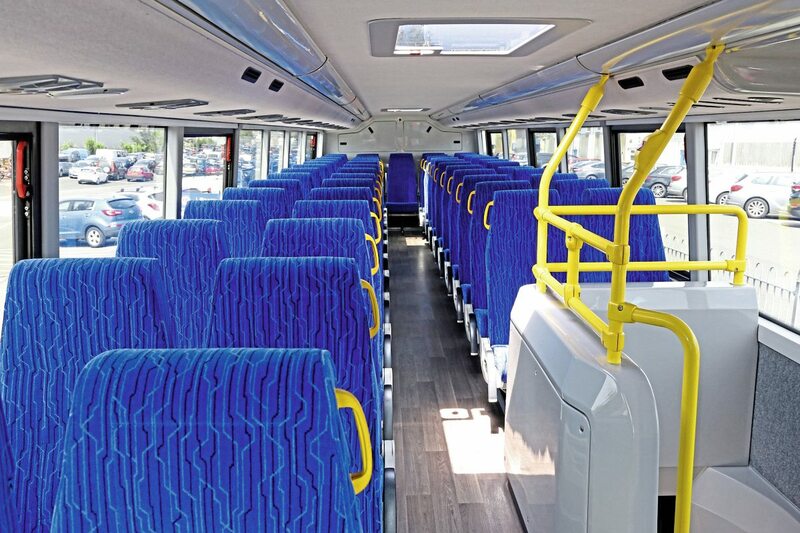 Group Marketing Director, Jacqueline Anderson reported on the successful introduction of the first two Enviro500 double-deckers, Edelweiss and Alpenrose, by Postauto in Switzerland. The third, named Heidi, will be shown at Kortrijk. The market in Hong Kong was proving tougher due to a trough in the replacement cycle, however the first Euro 6 Enviro500s had been delivered and low-height Enviro400s are being provided for the Peak route. 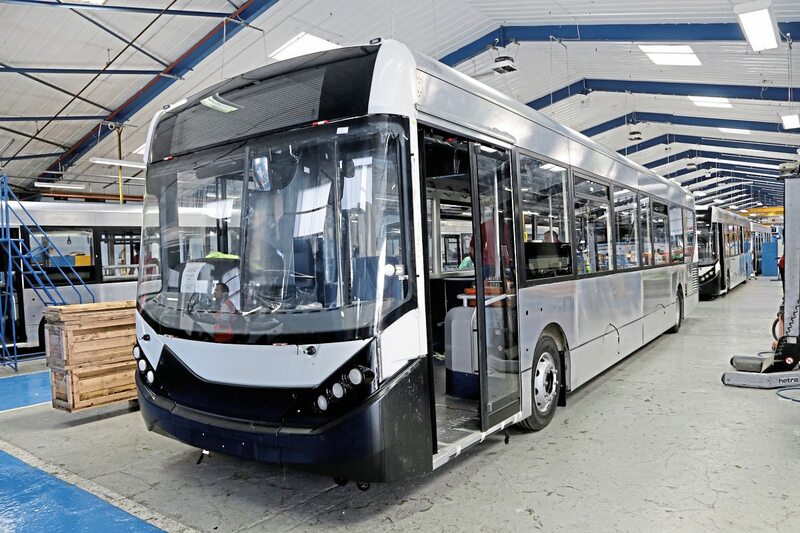 In New Zealand, the Enviro200 is now offered at 12.7m with three axles to meet the country’s weight limits and a batch of three axle Elites is being built in the UK. There is interest in the Enviro500 for tour work and that model is also attracting attention in Singapore and Malaysia. In the USA, production of the Enviro200 is being taken in house at Nappanee alongside the Enviro500. A major recruitment campaign was in progress to double output to ten vehicles per week. From UK factories, the first Enviro 500 SuperLo for the USA has been completed and the first deliveries of double-deckers from the 90 vehicle Mexico City order had been made. Jacqueline also provided an update of ADL’s proposed exhibits at forthcoming events. 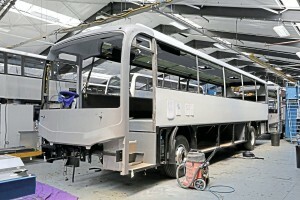 The APTA show in Atlanta would feature the SuperLo, a US standard 13ft 6ins Enviro500 and a US Enviro200. Alongside Heidi at Kortrijk, there would be a UK specification Enviro200. At the UK’s Coach and Bus 2017 event, ADL products would be promoted on the Mistral stand. 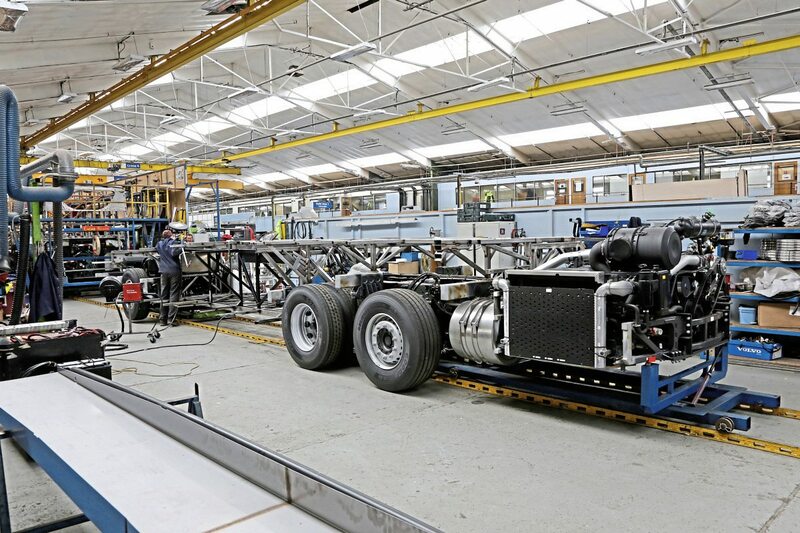 Since 2011, ADL’s share of the UK chassis market has been consistently over 40%, increasing to 47% in 2017 year to date driven by stronger performance of the Enviro200 in the midi market alongside continuing strong performance of the Enviro400 range. Managing Director – UK Sales, Arthur Whiteside, stressed that the company was not complacent and was working hard on product support and cost effectiveness. ADL’s sales strategy took a four pronged approach, volume orders from the big five, London (noting the distortion caused by the imposed order for 1000 New Routemasters), forward looking independent operators and the small but significant retail sector. For the latter, Enviro200s were always in stock and currently there was still demand from customers for the Euro 5 version. It is anticipated that there will be at least one more stock build of the latter with an expectation of selling approaching 100 units in 2017. Following recent route awards in London, Arthur announced that the ADL/BYD partnership had been successful in winning orders from Go-Ahead, London United and Metroline to take the number of Enviro200EVs in the capital to over 150. Retail Sales Manager, Richard Matthews looked back on the development of the ADL retail sales operation noting that: “Plaxton have taught ADL much about the retail space.” Started for bus in 2008 when ADL was considered too dependent on Stagecoach and London orders, it was merged into one team with coach sales in 2013, the year it started to achieve significant success with an order from Newport. Nottingham, Reading, Blackpool and trentbarton have followed alongside valuable business with smaller operators for both Enviro200 and high specification Enviro400 double-deckers. With each ADL model having a very wide range of options and optional equipment, ADL has followed the general motor industry in offering a number of specification bundles combining the most popular requirements. Intended to improve lead times and efficiency, it should also take the risk out of interpreting customer specifications and support them in growing their business. Explained by Customer Development Director, Keith Watson, there are initially four bundles, all except City being available on both Enviro200 and 400 models. As its name suggests, City is based on the Enviro400 City body with glazed staircase, sky view rear upper deck window and three roof windows with solar film. 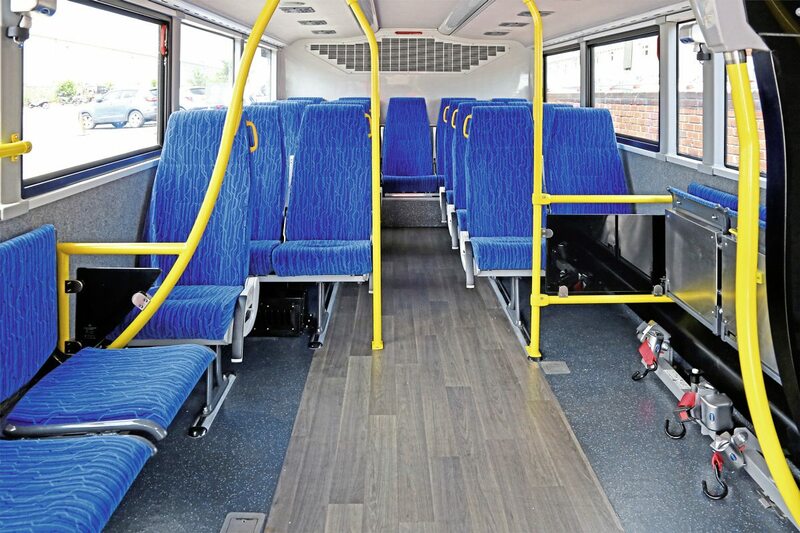 The Convenience and Safety bundle offers wireless bell pushes, USB sockets, under seat lights plus additional staircase lighting on the Enviro400. Ambience includes ambient sensed dipped beam and saloon lighting together with dimming of saloon lighting at speeds over 10mph. The Smart package is that which meets LEB certification and initially is only available with Voith Diwa transmission although a ZF option will be available in the near future. All bundles are available individually or in combination. The focus on increasing availability is a key aspect of ADL aftermarket support and AD Connected is a key element of this, building on data captured from vehicles to increase their future reliability. 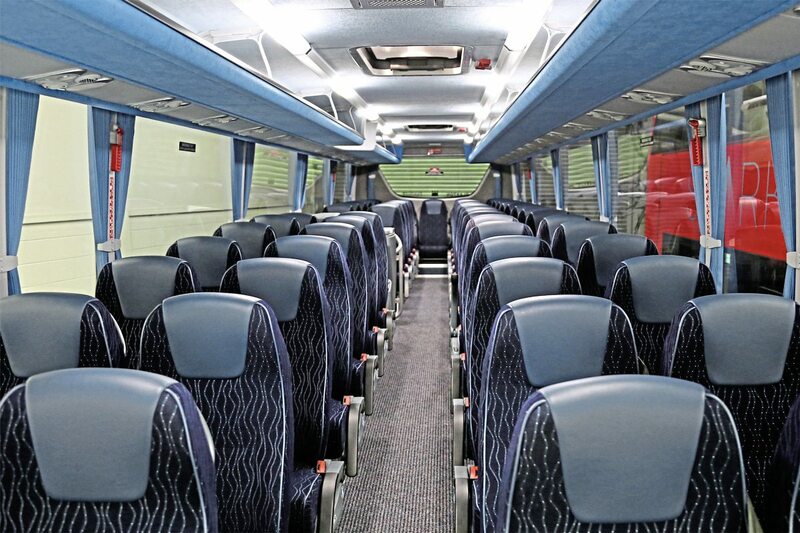 Group Quality and Customer Service Director, George McAdam, introduced the new product which is already in use by National Express, trentbarton and Blackpool in the UK and features in the contract for Enviro500s for Mexico and Switzerland. The system is cloud based with operational data added through robust tablets which have been configured working with operators to suit the needs of their staff, procedures and systems. 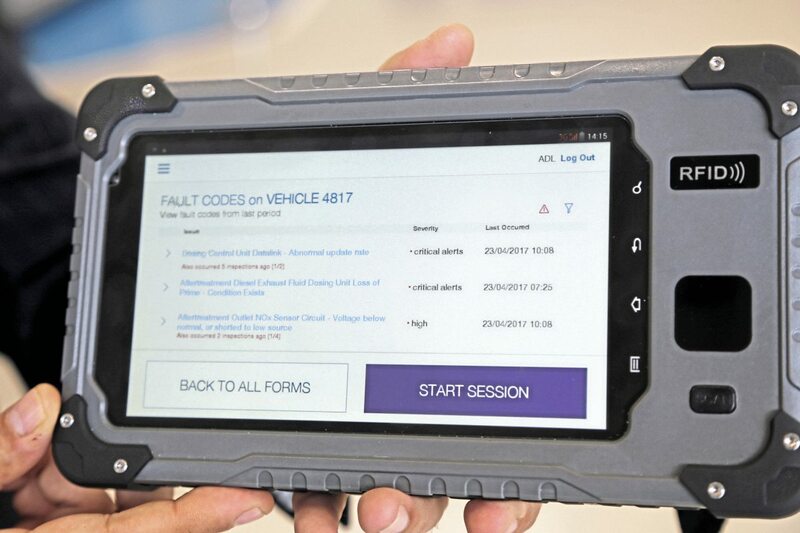 The operator can access dashboards to view live information on the fleet and it can replace paper based systems for inspection and repair operations. Safety critical issues have a formal sign off process and parts can be ordered and tracked through the system. Operators can use AD Connected for other makes of vehicle with around 80% data functionality and its use is expected to support preventative maintenance activities in addition to supporting compliance. ADL is working with the relevant bodies to get the system certified to DVSA requirements. 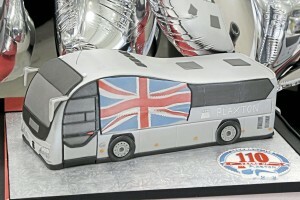 Much has happened at the Scarborough plant since it opened its doors to the public to mark the centenary of Plaxton in 2007. Investment and diversification by ADL has resulted in the direct skilled workforce more than doubling to 660 turning out some 20 vehicles per week. In addition, significant numbers of jobs are supported in local companies delivering sub-assemblies which are continually developed to their maximum complexity compatible with minimising the in house build time. 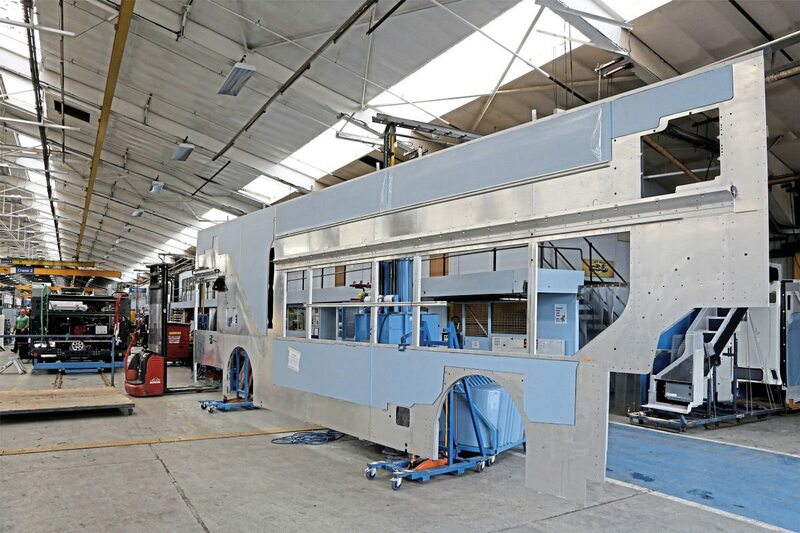 Five production lines are in operation, two producing Enviro200s, two Enviro 400s and one devoted to the considerably more complex stainless steel coach body build. This line is equipped to facilitate welded assembly, bolted and adhesive based assembly being used through the rest of the operation. 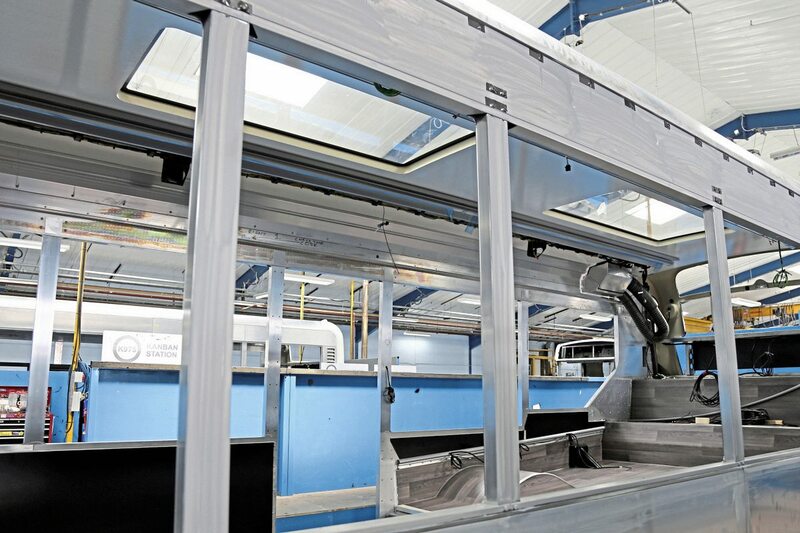 Sub-assemblies and chassis are married together and laser aligned at the start of their progress along the production lines. 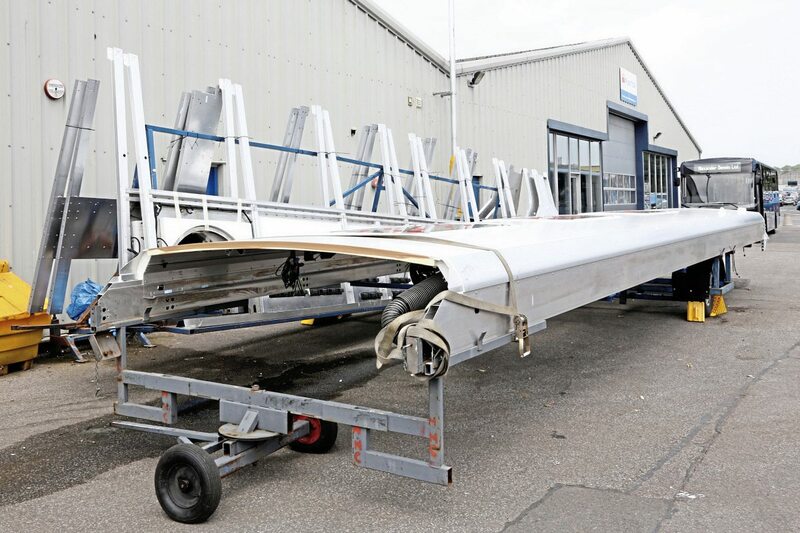 At the end of the line, the product is ready for the paint shop, moving from there to the finishing shop for final completion. All vehicles undergo a water ingress test. 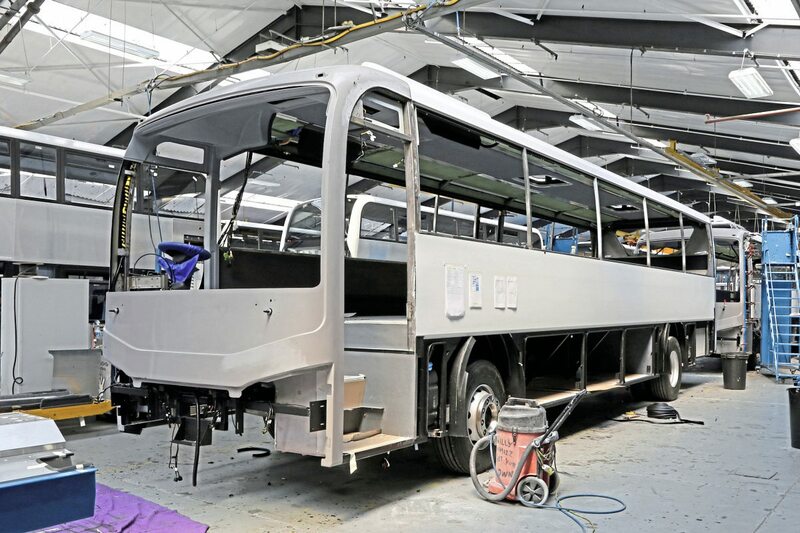 A variety of models were seen under construction including Enviro200 MMCs with the latest roof glazing option and Enviro400s to both conventional and City styling. All coach models are built on the one line with everything from Cheetah XL to Elitei being seen at various changes. Amongst them were a batch of 13.2m Elites for New Zealand with split windscreens. 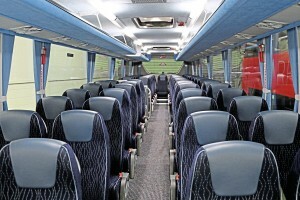 All coaches now have fibreglass extrusion side panels to improve quality and consistency. 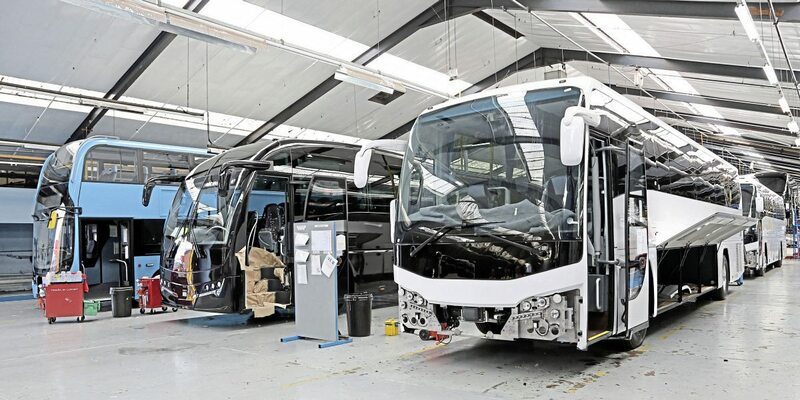 General Manager – ADL Scarborough, Alan Atkinson, who started out with Plaxton 45 years ago, explained the build process and advised that the average build time is around 500 man-hours for an Enviro200 and 700 man-hours for an Enviro400. Alan also introduced two new facilities on site, a £2m investment in sheet aluminium machining equipment which is operated on a three-shift system to maximise its benefit, and the PDI area. In the latter, a 60 point quality check on functionality and finish is carried out by a dedicated resource in a well-lit building separate from the main production areas. 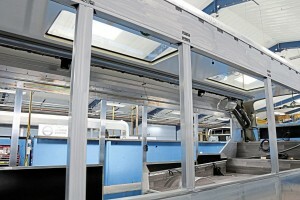 Any defects are rectified within the PDI area and details are fed back to the production line. The top ten defects by type are analysed and subjected to ‘find it-fix it’ forums to reduce future occurrences and increase future customer satisfaction. The process is already resulting in a fall-off in defects highlighted at the PDI stage. ADL had gathered six new vehicles around the Scarborough showroom to demonstrate the latest technology being delivered to customers worldwide. Outside were the latest 8.9m Enviro200 UK demonstrator and two UK built vehicles destined for the other side of the North Atlantic. Following success with the Enviro500 in parts of the USA, ADL has turned its attention to developing a Super-Lo version capable of handling the lower bridge height standards on the East Coast. The result is a vehicle just 3.91m (12ft 9ins) high that offers 1.8m headroom on the lower deck and 1.7m upstairs. 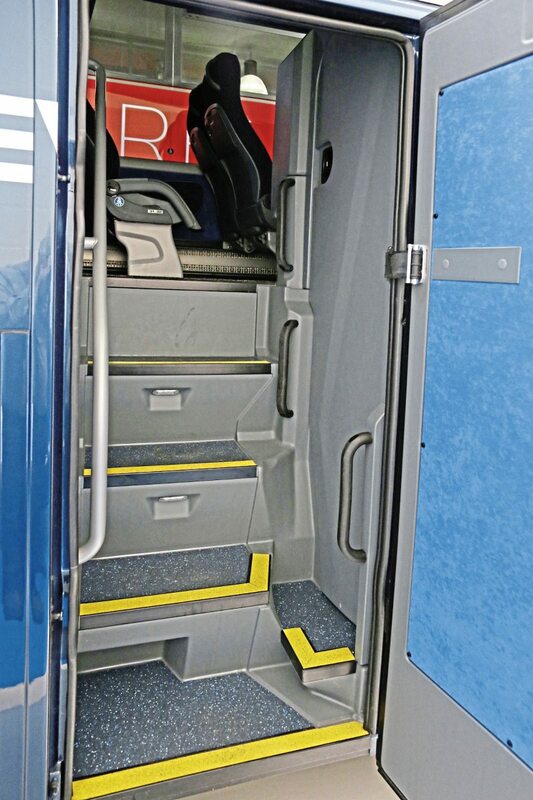 With a single doorway and staircase, the 14m vehicle has a capacity for up to 130 passengers on interurban routes. The first example built in the UK has Lazzarini Transito seats equipped with phone holders, USB charge points, light and wireless bell push. Glazing is bonded and the rear above the driveline is given over to heating and air conditioning equipment to handle temperature variations of -40 to +40 centigrade. The second export vehicle was one of the 90 Enviro500 double-deckers being delivered to Mexico City for the Reforma BRT line which features high kerbs for level entry. They feature a unique specification including an 8.9l Cummins ISL engine mounted in line and plastic seating throughout. 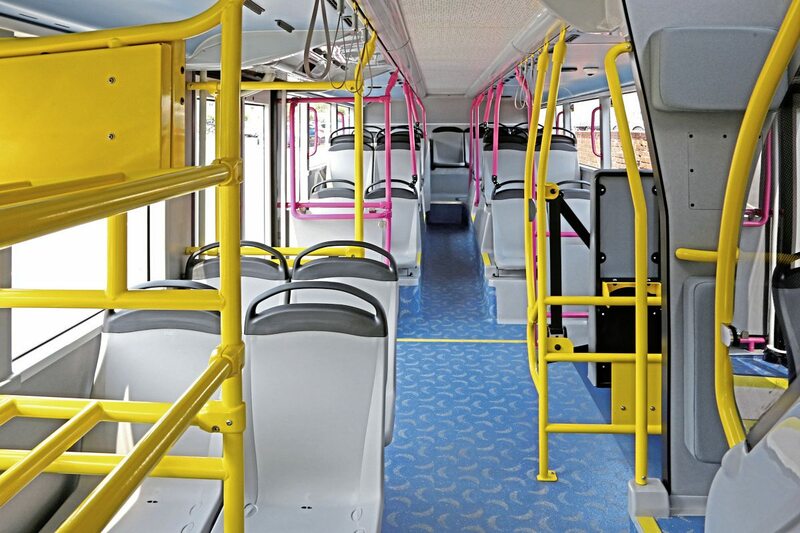 Part of the lower deck has poles in pink rather than yellow to designate a priority area for families. 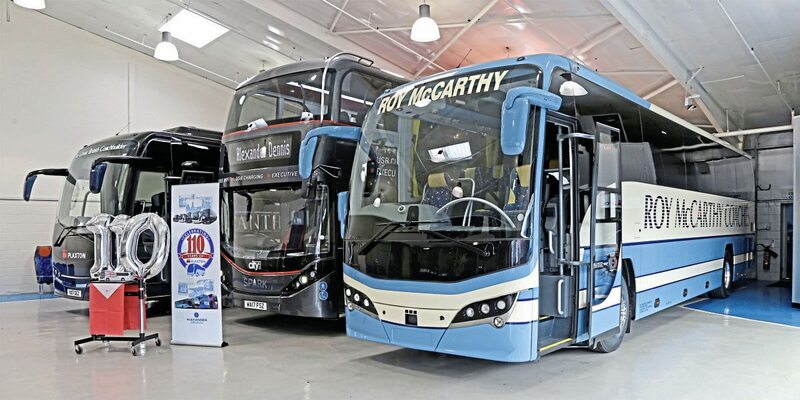 Within the showroom were three vehicles, a high specification Enviro400 City for Go-Ahead’s Plymouth Citybus ‘Spark’ operation and two Volvo B8R based Panther Execs, a 12.2m customer vehicle for Roy McCarthy Coaches in Macclesfield and the latest 12.8m 57 seat demonstrator. The latter incorporated a number of key features developed for 2017 including a revised centre staircase and toilet unit. The new unit comes as a complete moulded sub assembly, taking some 50 man hours out of the build programme. All key functional elements of the toilet are now directly accessible through an outside panel and the top of the unit is demountable to facilitate future upseating. 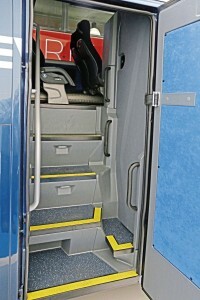 A driver specific locker is incorporated on the offside aft of the rear axle. Closing the day’s events, Colin emphasised that notwithstanding the pressures on the business, ADL was committed to building a more sustainable business with resilient income streams.